Saturday's mass rally "for fair elections" in the centre of Moscow may mark a watershed in the history of at least one of Russia's state-controlled television channels. Earlier in the week, there was a surreal situation when all three of the country's main channels completely ignored mass protests in Moscow and St Petersburg at the results of the parliamentary election. On Saturday, though, main news bulletins on all these channels led with reports of the Moscow protest and the lead report on the third most popular channel, NTV, was remarkable for its positive tone. NTV is owned by a subsidiary of state-owned gas giant Gazprom, and is thus effectively under the control of the Kremlin. In the run-up to the election, the channel had been accused of Kremlin "propaganda" for its reporting on the independent election monitoring organisation Golos. On Monday, thousands of people took to the streets of Moscow to protest against the results of the previous day's election, which they believed to have been rigged. The internet was full of reports of violations in the vote, including ballot-box stuffing and multiple voting, but the protest was completely ignored by the three main channels - Russia 1, Channel 1 and NTV. The same pattern followed on Tuesday, when protesters clashed with police and several journalists and parliamentary candidates were arrested. The silence was broken on Wednesday, when a report appeared on the Moscow edition of Russia 1's evening news about the events of the night before. It was highly negative in tone and basically warned protesters not to take part in unsanctioned rallies. The demonstration on Saturday had been planned well in advance and given the go-ahead by the Moscow city authorities. NTV's prime time bulletin kicked off by calling Saturday the day of "white ribbons" - reference to ribbons worn as a symbol of fairness by many attending rallies in Russia. Presenter Alexei Pivovarov continued with words that it would be hard to imagine a news anchor on one of Russia's state-controlled TV stations uttering even a few days ago: "Today Moscow has been the scene of perhaps the most massive rally in decades. "Tens of thousands of people who do not agree with the results of the recent parliamentary election came to Moscow's Bolotnaya Square. "In the protesters' opinion, the election results have been rigged in favour of [the ruling party] United Russia and should be cancelled, and central electoral commission head Vladimir Churov should be sacked." The correspondent's report continued in the same, positive vein and included slow sweeping panoramic shots of the demonstration and footage from different angles that appeared intended to give an impression of its massive scale. While the report did not include speeches from the platform, it did give vox pops of people expressing their discontent with the political system and some protesters chanting "new elections, new elections". It ended with the correspondent saying people were not calling for revolution because "fair elections are the best medicine against revolution". 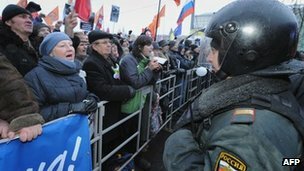 Russia 1 and Channel 1 also led with lengthy reports on the protests in prime time bulletins on Saturday. Russia 1's report, though, highlighted the heavy security at the Moscow event and dwelt on the presence of left-wing and right-wing radicals in the ranks of protesters. And Channel 1's bulletin gave the impression that the protests were almost exclusively a Moscow phenomenon. It mentioned a few other minor protests in the Far East and Siberia, but ignored much larger events in cities such as St Petersburg and Yekaterinburg. Both these channels quoted turnout figures in Moscow of 20,000-25,000 from the police and 40,000 from the organisers. They also both stressed the peaceful nature of the occasion. Russia 1 concluded that the day had been a "serious lesson" for everyone. As on the previous few days, the TV station giving the most extensive and immediate coverage of the "fair elections" rallies was the young, niche channel Dozhd, which in Russian means "rain". Dozhd has apparently forsaken impartiality by displaying a white ribbon fluttering from its logo. The station's owner, Natalya Sindeyeva, attempted to justify this policy by saying that it was a mark of "sincerity" rather than "propaganda", and a wish to be "mediators" rather than just journalists. EU diplomats are to due to meet to agree which Russian officials should be targeted in further sanctions over separatists' actions in Ukraine. The Houblon £50 note will soon be history - how many are out there? How many middle-aged men need hormone treatment?